A Dock Handler in GTA V.. 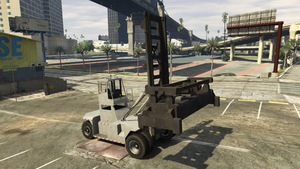 The HVY Dock Handler is an industrial forklift vehicle in Grand Theft Auto V and Grand Theft Auto Online. The vehicle is used by employees at the Port of Los Santos to move shipping containers. Trevor Philips, with assistance from Floyd Hebert, uses a Dock Handler to move containers at the Port of Los Santos while attempting to spy on a Merryweather Security Consulting protected freighter.